American Made Tom Cruise combines piloting skills and charm in the first trailer for Universal’s drug-running drama “American Made” as he crash lands a small plane full of cocaine in a suburban neighborhood. In the film, Cruise portrays 1980s pilot and hustler Barry Seal. “I was running drugs for the CIA, the DEA and Pablo Escobar,” he says in a voiceover. The film made headlines two years ago when a plane carrying crew members crashed on the set in Colombia in September 2015, killing two people and seriously injuring a third person. Local authorities believe that bad weather caused the twin-engine Aerostar to crash. Cruise was in production on the movie at the time of the incident, but was not on the plane. Universal decided last August to change the title from “Mena” to “American Made,” and move it from Jan. 6, 2017, to Sept. 29, 2017. 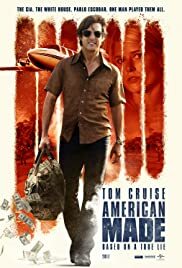 “American Made” is the latest collaboration between Cruise and director Doug Liman, following their collaboration on “Edge of Tomorrow.” The crime thriller also features Domhnall Gleeson, Lola Kirke, Jesse Plemons, Jayma Mays and Caleb Landry Jones.